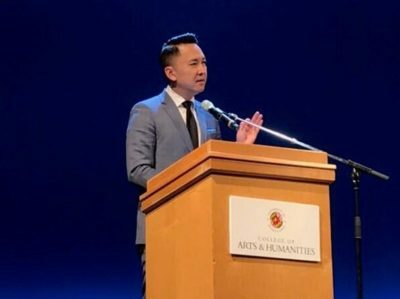 Viet Thanh Nguyen speaks at the University of Maryland about refugees and their stories in this article for The Diamondback. A Pulitzer Prize-winning novelist urged University of Maryland students on Tuesday to seek out and share the stories of refugees and other groups who often feel unwanted in their home country and in the United States. “We live in an age of narrative scarcity,” said Viet Thanh Nguyen, the best-selling author of The Sympathizer, which won the Pulitzer Prize for Fiction in 2016. Nguyen’s new book, The Refugees, was selected as this university’s 2018-19 First Year Book. The book is a collection of short stories from twenty years of documenting the hardships of relocation and explores what it means to belong somewhere. His visit is part of the “Year of Immigration,” an initiative by this university to increase dialogue about global migration and refugees. A MacArthur Fellow and professor of English, American Studies and Ethnicity and Comparative Literature at the University of Southern California, Nguyen has been called the “voice to the previously voiceless” by The New York Times, though he claims this is not praise. The lecture comes at a time when immigration has become a significant part of the national conversation. Two migrant caravans from Central America are currently making their way to the U.S., and President Trump has threatened to shutter the border in response. Earlier this year, following the U.S. Justice Department’s announcement of a “zero tolerance” policy for immigrants crossing the U.S.-Mexico border, several thousand migrant children were separated from their parents. The policy has caused significant national backlash. Nguyen has experienced family separation first-hand. He and his family, who fled war-torn Vietnam in 1975 when he was 4 years old, were forced to separate so they could leave the refugee camp they were staying in. Nguyen was taken to live with a sponsor — a white family — while his parents and brother were sent somewhere else. Months later, they were reunited. Nguyen describes himself growing up as being “born in Vietnam but made in America.” Never really sure of how to identify himself, Nguyen didn’t claim the term “Asian-American” as his own until he reached college. Many students in the nearly full auditorium at the Clarice Smith Performing Arts Center could relate to Nguyen’s message. Kak Wong, a physics graduate student from Hong Kong, said that though Nguyen’s experience is different than his, he still connected to the speaker’s story. James Ozaki, a University of Illinois student living in Washington D.C. this semester for an internship at the Smithsonian, is Japanese-American, and his grandparents were incarcerated during World War II. That helped him connect with what Nguyen was saying.